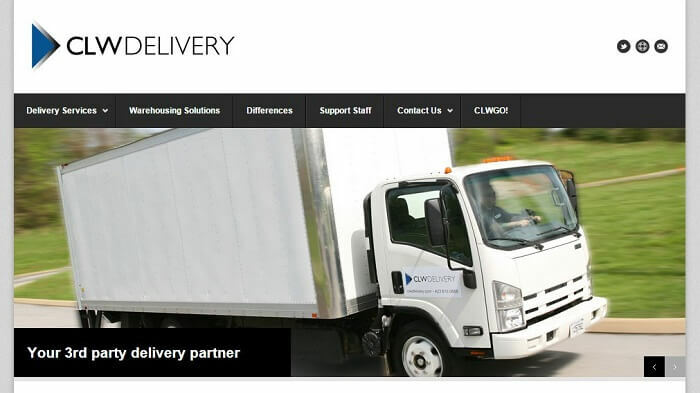 CLW is a third party delivery company that offers last mile services. With more than 30 years of moving goods and other items to their final destinations, CLW has become a household name in the Eastern United States. CLW Delivery has worked with community businesses and major retailers in this region. The company uses foot trucks to transfer boxes to the owners. However, it can use brand vehicles to transport the goods if the partner company makes such a request. Also, the dedicated staff ensures that the clients receive their deliveries in good condition. Safe delivery: A dispatcher tracks the items in transit to ensure that they reach their destination in perfect condition. Monitoring the deliveries prevents damage and reduces liability. Experienced staff: CLW employees are skilled in the installation of electronic, home appliances and other items such as lawn furniture and garden equipment. The delivery team can also help you to set up the delivered item at your request. Getting products to the ultimate customer on time is one of the challenges facing final mile delivery. Proximity is crucial to the timely arrival of packages. CLW has numerous locations in the United States to ensure efficient delivery of products. Since most online orders are from densely populated cities, the company has devised means of delivering purchased items to consumers. Despite the traffic congestion in such areas, CLW ensures that customers receive their deliveries without delay. Most of them receive the products the same day they ordered for them. CLW has maintained seamless delivery process even when there is a change in the destination of packages. However, consumers have to make such changes an hour before the specified delivery time. The company uses trucks manned by a worker that understand the traffic pattern in their areas. These employees are familiar with routes they can take to ensure timely completion of the last the last leg of the distribution channel. CLW delivery performs final delivery of products at affordable prices. The proximity of the delivery address from the distribution center or store and the volume of the packages determine the cost of the delivery. The administrative staff analyzes the situation to specify the cost of each delivery process. The following free delivery services make the cost reasonable. Use of Innovative Technology: This distribution company uses the latest devices to offer a unique experience to customers. It uses tracking code which allows consumers to visualize their deliveries on transit. Free Calls: The delivery team makes calls both before the trip and en-route to inform the customer about the packages. Installation without charge: CLW expert delivery team can help buyers to assemble and install home appliances on delivery for free. These employees are trained on the features of new products such as TVs and refrigerators once they are in the market. Use of New Technology: CLW utilizes GPS tracking and routing optimization to ensure efficient delivery services. Support Staff: These employees render help to the company’s clients. Warehousing Solutions: This third party delivery company has multiple secure warehouses at different locations to facilitate efficient delivery services. These structures are useful for temporary storage of packages before delivery. They also aid inventory management, data analysis, shipping and assembling of deliveries. Installation of Electronics and Appliances: CLW trains employees how to fix home appliances, electronics, and other items. They can aid customers to install microwaves, dishwashers, dryers, refrigerators, washers and televisions. They can render help in the arrangement of patio furniture and lawn equipment. CLW delivery is a perfect option for a final mile delivery company. It offers excellent services to satisfy its customers and keep them happy. Also, it ensures timely arrival of packages without damage. The company’s dedicated staff represents the client professionally as they can help the customers to set up delivered products. CLW delivery has helped businesses and retailers to reach their customers. Contact us if you require more information about our services or if you need our help. Our goal is to give you the best last mile delivery service. You can partner with us to complete your supply chain. Hey Buddy!, I found this information for you: "CLW Delivery 101: Areas, Hours, Fees". Here is the website link: https://all2door.com/clw-delivery/. Thank you.